Click through for the really big version. While I’m at it, here’s an interesting link on the structure of earth system models. I was wondering if you knew of any software that can be used to generate causal loop diagrams – particularly interested in the CLD format rather than the stock-flow diagram format, e.g. 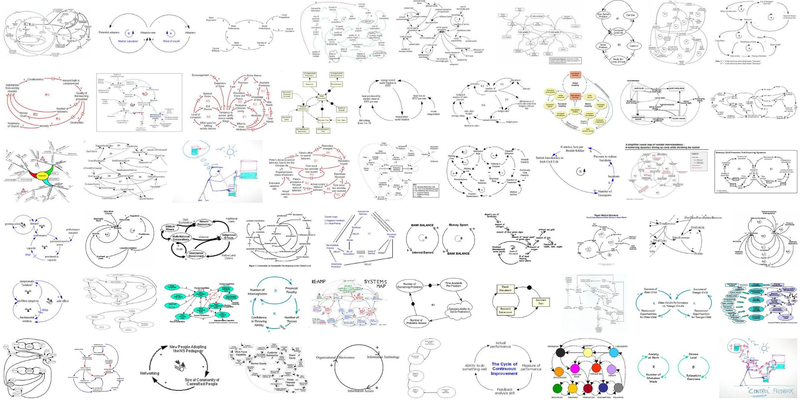 like Foresight/Shiftn’s obesity systems/causal loop diagram (see http://www.shiftn.com/obesity/Full-Map.html ). Thanks! I use Vensim for CLDs. It’s not as visually refined as your link, but it’s fairly fast and does have + and – tags for arrows, delay indicators, etc. There are actually two ways to do it – you can build a model without defining any equations, or use the comment fields (with “no cause” and “arrow junction” checked) if you want to have some redundancy in naming (i.e. use a name twice on the same screen without displaying as a shadow variable). You could prototype something in Vensim, then export to ppt or whatever to edit the vector graphics. I’ve looked at a lot of mindmapping and process diagramming tools and not found a good alternative. If you run across anything I’d be interested to hear about it here.